MEDINA, Minn., (Aug. 14, 2013) Polaris Industries Inc. (NYSE: PII), the leading manufacturer of off-road vehicles, has expanded its purpose-built commercial vehicle line, Polaris BRUTUS to include the BRUTUS base model with cab, heat and air conditioning, which is now available for order through authorized BRUTUS dealers in North America. 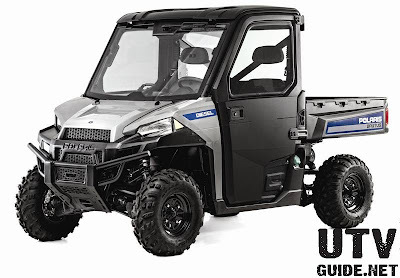 In March 2013, Polaris introduced the three-model BRUTUS lineup as the first side-by-side utility vehicle in the market to deliver front-end power take-off (PTO) capability. The new BRUTUS model enhances the level of comfort, versatility and productivity by integrating key offerings from the BRUTUS HD and BRUTUS HDPTO models. A fully enclosed, factory-installed cab with heating, defrost and air conditioning ensures operators are comfortable no matter what the outside conditions. As the only BRUTUS with an all-season climate controlled cab equipped with seating for three adults, the new model’s slide-through access makes it easy for passengers to enter and exit the cab. Also added to the new model is the electric bed lift for the pallet-sized cargo box, which is standard on the BRUTUS HD and BRUTUS HDPTO models. The full BRUTUS line includes standard features that are ideal for commercial applications. A 24-horsepower diesel engine with hydrostatic transmission, On-Demand True All-Wheel Drive, and treadle pedal for seamless- and shiftless- forward and reverse travel, provide operators with the power and functionality necessary on the jobsite. As the first side-by-side utility vehicle line to use a multi-link coil over De Dion rear suspension, BRUTUS delivers a superior ride quality, minimizes suspension sag when the 1,250-pound capacity rear cargo box is fully loaded and maintains class-leading ground clearance when trailering with its 2,000 pound towing capacity. All models feature Polaris’ exclusive Lock & Ride® cargo system, with a full line of cab, storage and vehicle protection accessories also available. BRUTUS vehicles come with a 12-month standard warranty. To find a dealer, and for more information on the BRUTUS line of commercial vehicles, visit Polaris.com/BRUTUS.